Cyclists, walkers and equestrians have good reason to consider a visit to the sunrise side of Michigan this summer. It’s called NEST, the North Eastern State Trail. 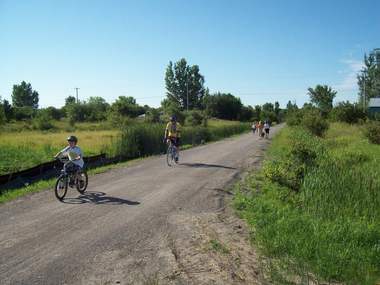 Michigan’s North Eastern State Trail will now provide a 70 mile ride for cyclists along the Sunrise-side of the state. The trail runs 70 miles from Alpena to Cheboygan. NEST is the collaborative brainchild of the Top of Michigan Trails Council, the Michigan departments of natural resources, transportation, and several communities. It was finished in fall of 2011, but public ribbon-cutting celebrations are planned for June 23. Trail officials and community leaders plan to simultaneously cut ribbons at all the towns along the trail at 8:30 that morning. Those ceremonies will be followed by bike rides to Onaway where a celebration lunch is planned at noon along with entertainment. The packed limestone trail is open to non-motorized recreation and to snowmobiles in winter. Horseback riding will be encouraged as well as cycling, walking and jogging. The trail corridor meanders through the northeast Michigan countryside, where lakes and streams and forests are plentiful. It connects an assortment of communities where visitors will have a place to rest and get a glimpse of earlier times in Michigan. NEST was built on the former Detroit to Mackinac City Railroad grade. It is a $3 million public investment. Its funding comes from federal transportation dollars, the state’s Natural Resources Trust Fund, Recreation Improvement Fund, and local community matches. Jim Conboy, a TOMTC board member in Cheboygan, said benches and overlooks will be eventually be built to enhance the trail. He anticipates it will be very popular locally and appeal to down-staters who would come for a day, weekend or more. Visitors to the area may also find the little town of Metz of interest. There was a forest fire there in 1908 – a very big fire at the height of the lumbering era. It consumed more than 2 million acres, ravaging nearby towns. There is a historical marker there today. A rescue train sent to Metz for its inhabitants never made it back to safety. Many died when the train, just two miles out-of-town, was derailed by the fierce heat that split the rails. State officials say NEST is a significant addition to the state’s growing rail-trail networks. It is the second of three trails that will eventually fan out from the top of Michigan. That network includes the 62-mile North Central State Trail from Cheboygan to Gaylord which opened in 2008. As it came to fruition, planning began on the North Eastern trail. Now that it is up, construction has started on a third trail, the North Western State Trail from Mackinac City to Petoskey. “It’s going to give people some great biking opportunities,” Jim Radabaugh of the DNR said about the trail network. Phase 1 of North West trail, from Petoskey to Alanson, should be completed some time this year, according to Radabaugh. Alanson to Mackinac City is to follow. Hefele is counting on a similar public reaction to the NEST. He said the local business community is excited too. For instance, consider a return-trip in September for the Potato Festival where polkas and potato recipes and are standard fare for the largely Polish community in Posen. Ocqueoc Falls in Presque Isle County is not far away. The state is dedicating a new wheelchair accessible trailhead there. It has six miles of hiking to offer and the highest falls in the Lower Peninsula. Then, of course, you can go back in winter. There are more than a few good reasons to plan a trip there. For more information about NEST and the festivities planned, see trailscouncil.org. This entry was posted in Uncategorized and tagged DNR, NEST, North Eastern State Trail, Railtrails, Trails. Bookmark the permalink. It’s a great trail in a great area, too bad that there’s very little camping opportunities in the area other than a couple of state parks.